I’m sure you’ve all seen cartoons like this one before. 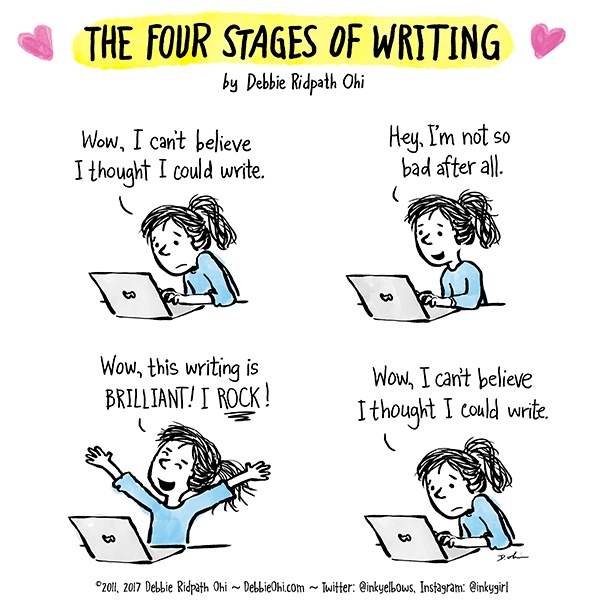 Right now, I’m in the fourth stage of this particular cartoon. I’ve been working on the same MG MS for about 2 years–not as long as some projects I know, but still, it’s a long time. It’s the first book in a trilogy, and right now I’m in a place where I feel the second book is better, but the first book is needed, but is the first book working and what do I do about that and what if it never gets published….etc. All writers go through this and this is not my first rut with a project. The struggle for me right now is that I’ve read this MS so many times I can’t tell what or if anything is “wrong” with it. Every time I re-read it I find a chunk I think is boring or tedious, and I can’t tell if it’s because I’ve been reading my own work for 2 years or because it really is that boring and tedious. This MS has been through my critique group and a few MS swaps. I’m always open to other people’s ideas and suggestions. If they find the same spots boring and tedious, then perfect, time to cut it out and replace with more action. I’ve also had people tell me what is not working and then I go back and “fix” the issue as best I can. The problem is, I can’t expect my MS swap people to keep re-reading the same book over and over, and I’m not sure I can afford to hire an editor on retainer! I’m also at the point where I wonder how many MS swaps are too many. I’m swapping with someone after NaNoWriMo season, and I thought about sending them a different MS, but now I’m thinking I need at least one more pair of eyes to either confirm or deny my bleak thoughts about this one I’ve been picking at. I have made changes since my last swap so I know it won’t be a bad idea, now the question is how many more swaps until I feel confident enough to start querying again? Long story short, ruts are hard. I know I’ll get out of it, it’s just a matter of me deciding when to push forward and get this thing done right or set it aside and work on something new. Come December I’m hoping to have a better sense of what I need to keep writing, whether it’s with this book or another one.